Ever have an experience that felt surreal, as though you’d been suddenly transported into the twilight zone, where time seemed to warp, perhaps slowing down or speeding up? Tell us all about it. If you haven’t had an experience in real life that you can draw from, write a fictional account of a surreal experience. Photographers, artists, poets: show us SURREAL. I take the camera everywhere. You never know if one day you will have the opportunity of taking THE Photograph. The one that will make you famous, the one that will be be put on the front page of a magazine called “Photographer”. So, OK, I dream on until that day when it happens. I was actually in the moving car and was snapping away, Mr. Swiss was driving. It was a misty day and what the lens captured was more luck than judgement. I arrived home and downloaded the results on the computer. It was then that a photo appeared with a lamp post. 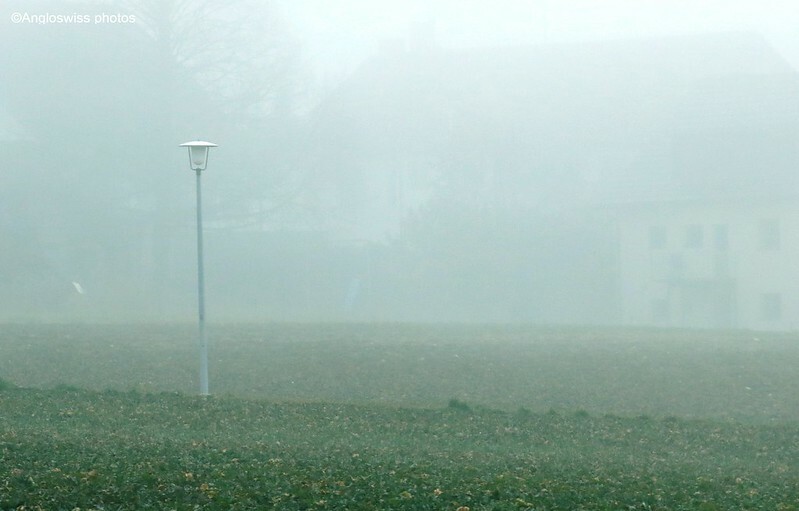 I know lamp posts are not the thing to stay in the viewer’s memory, not exactly Pulitzer prize worthy, but it might be the success of the year, what the Pulitzer people were searching for: a Swiss lamp post in a Swiss field taken with a moving camera. “Where did you take that photo?” asked my other half. “On the way home from the shopping trip, just near the monastery.” Our town has a cathedral, and a few monks that live in the monastery. And sure enough I saw the faint outlines of a farmhouse. I also did not remember seeing a farm near the monastery. The monks were quite self-sufficient. They had a few cows, some chickens and even planted all sorts of herbs and vegetables, so it certainly was not part of the monastery. I decided to have a closer look. Later that day I took a walk to where the photo originated. The mist had cleared although everything seemed to be covered by a sickly yellow light. The lamppost was now, well just a lamppost. Nothing special and in the background was …. nothing: just an empty space, a large field. It was then I met a monk walking towards me on the path. He seemed quite ancient, and his walk was slow and careful. He looked at me with his rheumy eyes peeping out of a patchwork skin, flecked with brown stains , and I wondered if he was actually able to let me have some information, although quite frankly he would have played an ideal role in “The Walking Dead”. He greeted with a quavering shaky voice and I answered with a “hello”. He stopped and looked at through me. The monk gazed in the direction where the farmhouse would have been. But the monk was no longer there, the mist had appeared again and there was nothing to see, perhaps just the faint outlines of a farmhouse. I think I read too many horror books, now where did I read the word “nevermore” – a poem by Edgar Allen Poe about a raven? Of course, when I arrived home I took another look at the photo. What photo? Even my computer decided it did not want to be possessed. All the photos from my morning shooting session were there, but there was no photo showing a lamppost with a farm in the background. Surreal journey: Daily Prompt | ALIEN AURA’S BlOG: IT’LL BLOW YOUR MIND! Time Warp | Views Splash! Surreal | Real Life Co. The Great Migration | Oh Danny Boy! Daily Prompt: Twilight Zone | Yowza, Here We Go! I took the photo two days ago. Pingback: Moving back home will make anyone feel as if they’ve entered a 1950′s pod people movie. | The Bohemian Rock Star's "Untitled Project"
That’s just spooky. So well-written. You evoked an utterance from me at “there is no longer a farmhouse here”. BTW I think your cover picture of Solothurn, Switzerland is one of the prettiest pictures I’ve seen of anywhere in Europe. I can feel the cold and dampness; the gray day; and the stalwart buildings. Thanks. Also for the comments about Solothurn. This year we had almost no snow. We live in a small village just along the road from Solothurn. The funny thing is when I put the photo on the computer, I did not see the farm in the background. Only when I was tuning the photo a little it appeared slowly. Love story behind photo… And I belueve I read some Edgar Allen for assignment back in high school days (Nevermore & Raven rings some bells).